When soldiers go to war, what do their families and friends experience? There is huge public support for the military, who risk their lives in faraway war zones, but do we really have any idea what their 'nearest and dearest' go through while the troops are away? This book started out as a diary of a year in the life of Stephen Wynn, a police officer who happens to have two sons in the military. The diary was his mechanism for coping with the passion, distress and rage he felt while his sons - Luke and Ross - were on active service in Afghanistan. 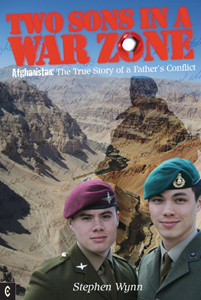 Two Sons in a War Zone is his compelling true story, illustrating the raw inner conflict between one man's pride for his sons and their chosen profession, and his natural fears for their safety. In vivid, everyday language he describes the intense experiences - the joys and sorrows - of being a 'loved one' at home, whilst his sons battle a deadly foe in gruelling and treacherous conditions. Stephen describes Luke's and Ross's personal stories - why they joined the military and how they relate to the work - and quotes from private letters and documents. Both sons are injured whilst on their first tour of duty (one narrowly escaping serious harm from a bullet wound) but thankfully they return safely home. Nobody reading this book will have any doubt about the sacrifices made by soldiers who go to war, as well as the anguish their loved ones experience at home. STEPHEN WYNN was born in Leeds in 1958. He has been a police officer since 1983, specializing twice during his service: first for nine years as a member of a specialist firearms unit and, for the last eleven years, as youth liaison offer working to keep youngsters away from criminality. For the past seven years he has been married to Tanya, his partner and best friend, and they live in Essex with four very lively German Shepherd dogs. Stephen has three children: Luke aged 23 and Ross aged 22 – both currently serving in the military – and Aimee, who is aged 10. Stephen's main hobbies are football (he supports Leeds United Football Club) and writing (he has several fictional projects in various stages of development). He describes himself as a straightforward and uncomplicated person.